It all started when my dear friend Jim sent me an email proposing that i jump onto a Southwest Airlines non-stop flight to St. Louis, where i would be met in the baggage claim area by him and his wonderful wife Cynthia, whisked effortlessly through rush-hour St. Louis and on to Rolla, MO and the home of his son Mark and his wife Stephanie, who would be my hosts for an eventful weekend. Once my luggage and i were safely stowed in their car, i would be driven straight to Rolla and to the home of Mark and Stephanie. I’d known Mark when he was a little boy, and then saw him again about 1990, when he and Stephanie were on a pre-honeymoon trip and had been given a wad of money by Jim to take me out to the Thai House, that legendary Thai restaurant on Henry Street. They were foodies and loved it, which was Jim’s plan. I found them delightful, which was also Jim’s plan. I’d decided in 2009 during my month in Amsterdam that i simply no longer had the strength to deal with a transatlantic flight and the rigors of hanging out with my Dutch friends for a month. And once i’d got back, i realized that the whole airplane experience was one i could no longer handle, regardless of the distance. Still, Jim’s offer was seductive because it had been many years since i had seen any of these delightful people. Besides, how much easier can a trip be than one in which you are picked up at the baggage claim and returned to the airport shortly before your flight back home? Another factor was that Mark and Stephanie had gone from being mere foodies to accomplished gourmet chefs who every month threw a large, fine dinner for a few lucky friends. I knew about these because Mark for some time has been including me on the email invitation list that details the menu for the upcoming dinner. Over which i’ve slavered and commented back, never dreaming that i’d get to attend. One of these grand dinners was scheduled for the day after my proposed arrival. How could i say anything but yes? So i booked my flight and started fretting over what San Francisco delicacies i might bring. I finally decided on nectarines from Rodin’s, raspberries from Yerena, cherries from Alfieri, blueberries from Alpine, and five cooked crabs. How to get them there? Well, easy for the crabs, on the morning of my departure i put them in a small cooler with lots of those frozen ice substitute blocks that don’t melt after they’ve done their duty. The fruit i packed in the boxes that my 8oz. canning jars come in, leaving the little baffles in there to keep the fruits from crushing each other into a pulp. I closed each box by using another jar box upside down without the baffles. Then i filled the suitcase with gifts, toiletries, and clothes. Ta da! There was an issue at SFO that deserves its own post, but after that the flight was just perfect. I managed to get an aisle seat, and when a young woman took the window seat, i spoke pleasantly to her, the novel i was reading resting in my lap so that after this bit of etiquette i could while away the flight productively. She spoke back, and the rest of the trip is a blur because we didn’t stop talking until we were ready to deplane. An entertaining person beside you always makes for a glorious trip, and it’s especially wonderful to have one when you’re in constant pain and they serve as a distraction. Sure enough, Jim and Cynthia were waiting for me in the baggage area, and the trip to Rolla was uneventful – except for a detour to a fine fishmonger to pick up some fresh halibut and a Google-assisted surface street tour of suburban St Louis to avoid Friday 5 o’clock since we were all talking nonstop. Mark and Stephanie’s house was impressive, not lavish but rather superbly comfortable and resolutely dedicated to their shared interest in cooking and dining. For example, what was originally a large family room had been repurposed as a dining room with an immense table that would easily seat a dozen people. The kitchen was a modern marvel, with the latest appliances up front and lots more tucked out of sight. The refrigerator was this gigantic silver thing, and the two drawers underneath the countertop beside it were a freezer so the refrigerator didn’t waste space on a freezing compartment. When i opened my suitcase in what i’d planned as a grand display of the fruit i’d brought, there was mashed fruit everywhere. Nevertheless, we all gathered around and retrieved, separated, and refrigerated the fruit. The nectarines and cherries were pretty much unscathed, but a number the blueberries were mangled and the poor raspberries were well on their way to being a waffle topping. The next morning i raced to the kitchen, only to find Mark and Stephanie already hard at work preparing everything for the dinner that night. I joined them. And since the dinner deserves a separate post, i’ll stop here. Well, one note: When i got back here and unpacked the now-nearly-empty suitcase, i found a clue suggesting that the devastation might not have been all my fault, a NOTIFICATION OF INSPECTION (NOI) slip informing me that – to protect me and my fellow passengers from terrorists, socialists, demmercrats, and other bad guys – my suitcase had been opened and the contents inspected. Clearly the integrity of my protection system was compromised during the inspection, resulting in the battery of the berries. Once they’ve torn everything open, they just stuff it back into the case however they can. Meanwhile, speaking of food, i routinely go to Sushi Zone after my Italian class, and last month i realized that i deserved a more luxurious meal. 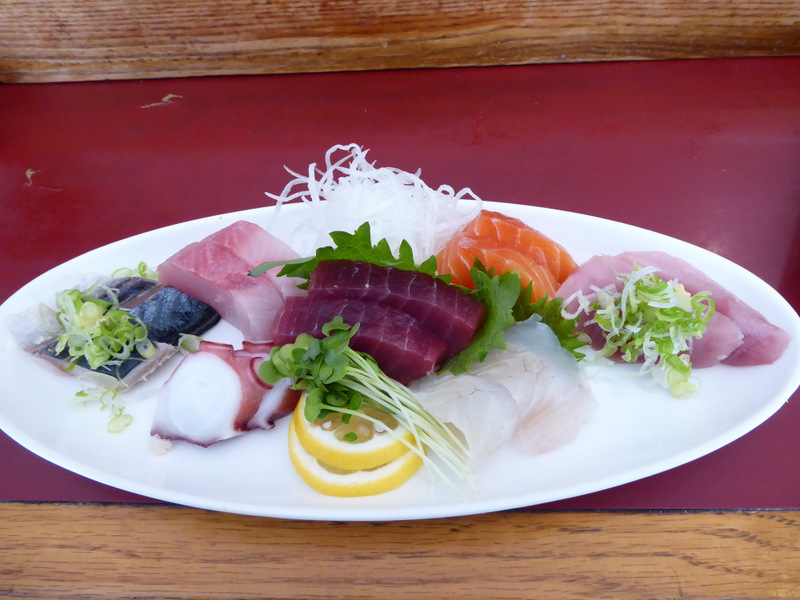 I ordered the sashimi platter with miso soup and an Asahi. 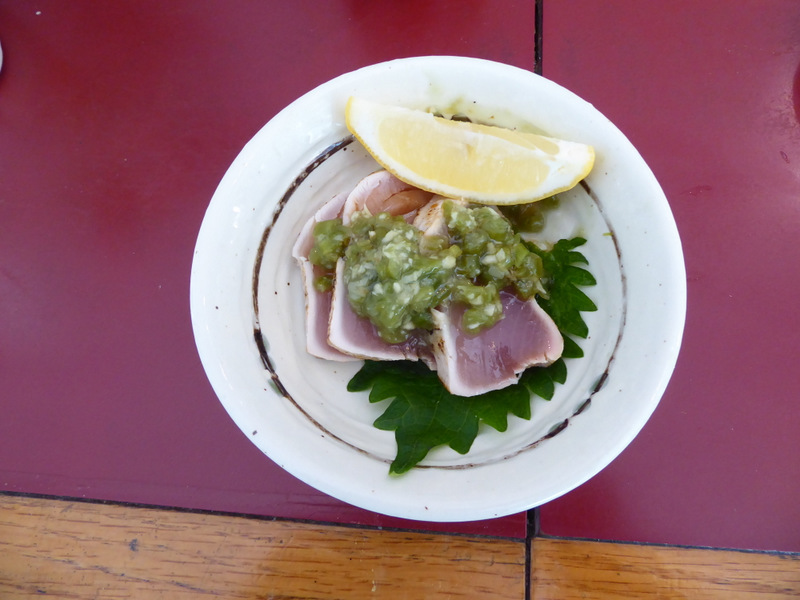 And then Yoshi handed me a little extra plate, a chunk of tuna that he’d briefly held in a pot of simmering dashi, sliced, and garnished with macerated green onion. Great foodie post. Breathlessly awaiting chapter two.